Easy, healthy, and delicious Carrot Cake Granola filled with oats, carrots, coconut, raisins, walnuts, and the perfect blend of spices! This gluten-free and vegan granola is free of refined sugars and makes a great breakfast, dessert, or snack! Granola is one of those things that I make quite frequently as my toddler adores it, and it is SO incredibly fun, easy, and cost-effective to make! 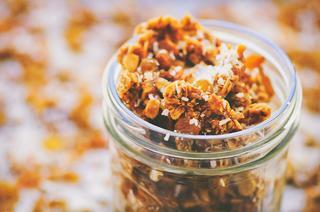 I'm always playing with various flavor combinations, and as a family that also loves their carrot cake, it was just a matter of time before I made this AMAZING Carrot Cake Granola . . . This Carrot Cake Granola is chock-full of oats, carrots, coconut, raisins, walnuts, and all of the tasty warming spices you would expect from the perfect slice of carrot cake! We like it as a healthy breakfast, as a quick pick-me-up afternoon snack, and as a yummy dessert (it's great with vanilla yogurt!). It's now a pantry staple, and I can only hope you love it just as much as we do! Preheat oven to 275°F. Line a cookie sheet with parchment paper; set aside.In a saucepan over medium heat, combine maple syrup (or honey), coconut oil (or butter), and vanilla extract. Whisk until smooth and combined. Turn off heat.In a large mixing bowl combine oats, carrots, walnuts, coconut sugar, cinnamon, nutmeg, cloves, and ginger. Stir combine.Pour your warm syrup, oil, vanilla mixture over your oat mixture. Stir vigorously until all is evenly coated.Pour your granola mixture onto your prepared cookie sheet.Bake for 25 minutes.Remove from the oven, and sprinkle raisins and coconut over top.Return to the oven and bake for 10 minutes longer.Remove from the oven and let cool completely before serving or storing.Enjoy!